Why write about music? It’s a fair question for an aural art form. A listener can simply enjoy the beauty of hearing the “Prelude to the Afternoon of a Faun.” But how much more delightful if the listener also understands how Debussy achieved the musical equivalents of the words sinewy, sideways, and drowsy? Born in France in 1862, Claude Debussy lived and composed during a period of remarkable company. He was born within five years of Giacomo Puccini, Gustav Mahler, Richard Strauss, and Jean Sibelius. Three years after Debussy’s birth, Richard Wagner’s opera “Tristan und Isolde” was given its premiere. Davidian is tasked with explaining to non-musicians why Debussy was credited with this awakening. What is it about “Afternoon of a Faun” that constituted such groundbreaking music? It’s much harder to discuss harmony in a non-musical language. How to write about the radical nature of “Afternoon of a Faun” in the context of its time without using the word chromatic? Davidian writes about the opening flute solo: “Contributing to the relaxing almost sleepy quality of the opening flute solo is the wavy shape of the melody, which slides up and down chromatically between two notes, C# and G. . . . Is the solo melody centered on C# or G? Or is it centered on two pitch centers? We just do not know at this point what the key of the piece is, and there are no supporting harmonies to give us a clue.” Our understanding is enhanced but only if we speak this language. The non-musician needs a road map. The pitch center is telling us the music wants to go back to “are.” While Debussy still used a system in “Afternoon of a Faun,” it’s no longer the strict system that so dynamically tells the listener where the music is going next. Instead, it’s music that has been suddenly freed from centuries of harmonic laws of attraction. Those laws tell our ears that when you sing “like a diamond in the sky,” not only is the song not at the end but something is unsettled and needs to be resolved. Composers of the 19th century were steeped in those laws of attraction. The most famous symphony of all time¾”Beethoven’s Fifth”¾was premiered in 1808. The end of his first movement takes the idea of harmonic attraction and hammers it home with the subtlety of a freight train. In the tune, “Here Comes the Bride,” the word comes is the pitch center. The word here leads back to the word comes. 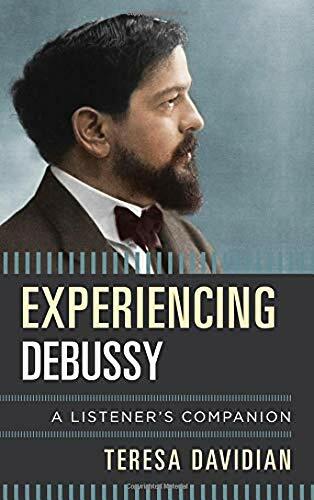 Beethoven alternates between “here” and “comes” until the listener would find it unimaginable for the piece not to end on the word “comes.” For Debussy to close the same century by upending those laws was truly radical. Although a listener’s companion doesn’t have the same mandate as a musician’s biography, Davidian includes personal details that allow the listener to put together the puzzle of Debussy’s life. In emphasizing Debussy’s attendance at the 1889 World’s Fair in Paris, she’s giving the listener insight: what contributed to Debussy’s break with the traditional harmonic laws of a melody which develops and leads? He was exposed to Javanese gamelan music at that fair¾music which has a more static harmonic structure. Patti Niemi is is the author of Sticking It Out: From Juilliard to the Orchestra Pit, A Percussionist's Memoir. She has played percussion in the San Francisco Opera Orchestra since 1992.